A twist of fate. An epic jam session. An electrifying musical. I'll be out on opening night so check back soon for my full review. 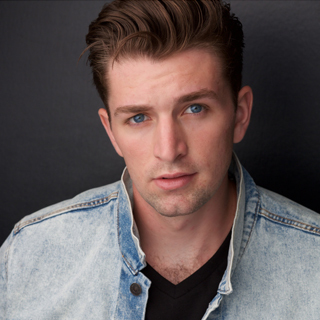 There’s a whole lot of shakin’ goin’ on with the smash hit MILLION DOLLAR QUARTET, Marriott Theatre’s latest production running January 16 through March 10, 2019 with a press opening on January 23 at 7:30 p.m. at 10 Marriott Drive, Lincolnshire. This production of MILLION DOLLAR QUARTET stars Christopher J. Essex as “Johnny Cash,” Rustin Cole Sailors as “Elvis Presley,” Shaun Whitley as “Carl Perkins,” Nat Zegree as “Jerry Lee Lewis,” David Folsom as “Sam Philips,” Laura Savage as “Dyanne,” Zach Lentino as “Brother Jay,” and Kieran McCabe as “Fluke.” This rockin’ tribute is directed by James Moye, joined by Jeff Award-winning Musical Director Ryan T. Nelson. 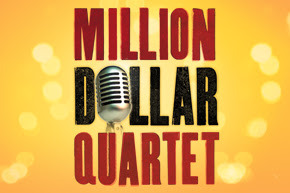 MILLION DOLLAR QUARTETcaptures the contagious spirit, freewheeling excitement, and thrilling sounds of the once-in-a-lifetime event where four of music’s best talents came together. There’s a whole lot of shakin’ goin’ on with the smash hit MILLION DOLLAR QUARTET, running January 16 through March 10, 2019 with a press opening on January 23 at 7:30 p.m. at the Marriott Theatre, 10 Marriott Drive, Lincolnshire. Inspired by a true story, this rockin’ tribute is directed by James Moye, joined by Jeff Award-winning Musical Director Ryan T. Nelson. MILLION DOLLAR QUARTET captures the contagious spirit, freewheeling excitement, and thrilling sounds of the once-in-a-lifetime event where four of music’s best talents came together. MILLION DOLLAR QUARTET is set on December 4, 1956, when an extraordinary twist of fate brought Johnny Cash, Jerry Lee Lewis, Carl Perkins and Elvis Presley together at Sun Records in Memphis for what would be one of the greatest jam sessions ever. MILLION DOLLAR QUARTET brings that legendary December night to life with an irresistible tale of broken promises, secrets, betrayal and celebrations that is both poignant and funny. Relive the era with the smash-hit sensation featuring an incredible score of rock ‘n’ roll, gospel, R&B and country hits, performed live onstage by world-class actors and musicians. Hit songs include: “Blue Suede Shoes,” “Fever,” “Walk the Line,” “Sixteen Tons,” “Who Do You Love?,” “Great Balls of Fire,” “Folsom Prison Blues,” “Whole Lotta Shakin’ Goin’ On,” “Hound Dog,” and more. 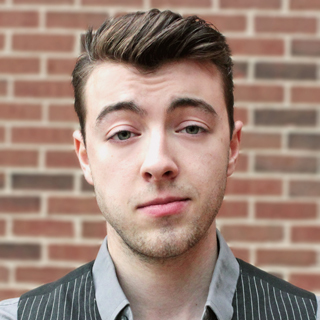 The cast is understudied by Lexis Danca, Brian Grey, Colte Julian, Doug Pawlik, Jake Saleh, Anthony Scandora and Steven Romero Schaeffer. The production will feature set design by Jeffrey D. Kmiec, costume design by Theresa Ham, lighting design by Jesse Klug, sound design by Robert E. Gilmartin, properties design by Sally Zack, hair and makeup design by Miguel A. Armstrong and musical supervision by Patti Garwood. 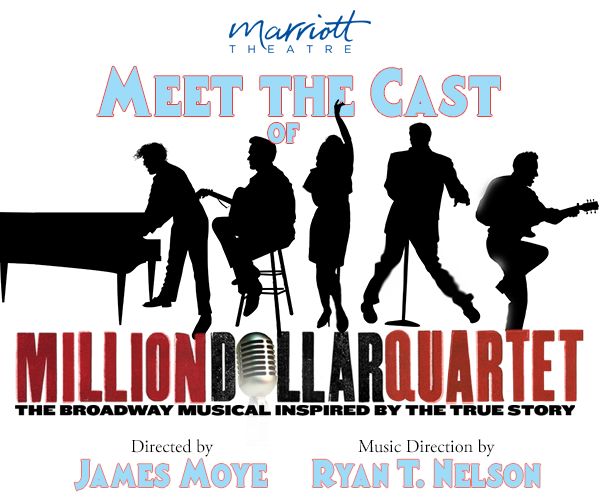 The performance schedule for MILLION DOLLAR QUARTET is Wednesdays at 1:00 p.m. and 7:30 p.m., Thursdays at 7:30 p.m., Fridays at 8:00 p.m., Saturdays at 4:00 p.m. and 8:00 p.m., Sundays at 1:00 p.m. and 5:00 p.m., with select Thursday 1:00 p.m. shows. Ticket prices range from $50 to $60, excluding tax and handling fees. Call for student, senior, and military discounts. On Wednesday and Thursday evenings there are a limited number of dinner-theatre packages available for purchase through the Marriott Theatre Box Office. To make a restaurant reservation, please call 847.634.0100. Free parking is available at all performances. To reserve tickets, please call The Marriott Theatre Box Office at 847.634.0200 or go to www.ticketmaster.com. Visit www.MarriottTheatre.com for more information. Movies On Our Radar: THE KID WHO WOULD BE KING Opens January 25th! 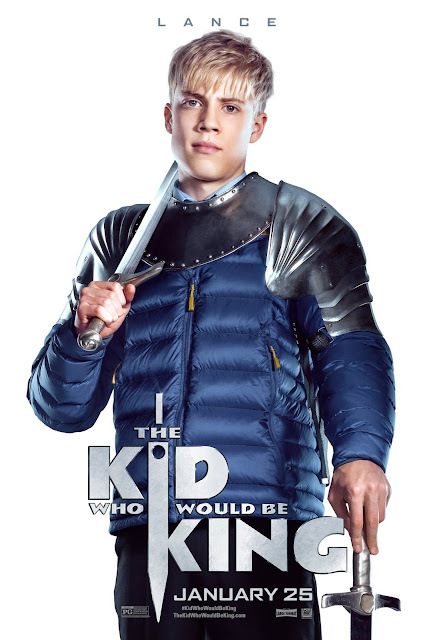 opens in theaters everywhere on January 25, 2019! 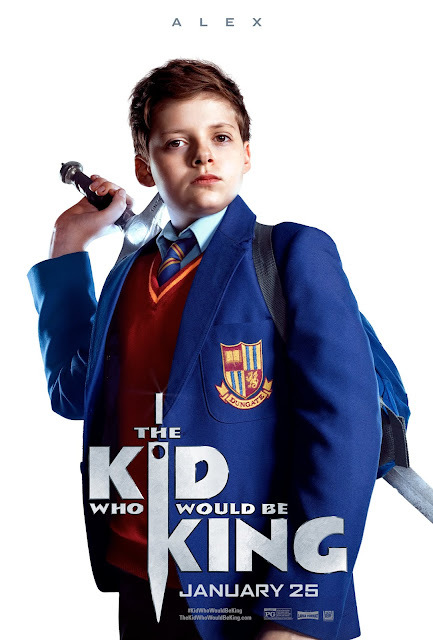 20th Century Fox has released the new trailer for THE KID WHO WOULD BE KING, which tells the story of Alex, who thinks he's just another nobody, until he stumbles upon the mythical Sword in the Stone, Excalibur. He must unite his friends and enemies and, together with the legendary wizard Merlin, take on the wicked enchantress Morgana to become the great leader he never dreamed he could be. 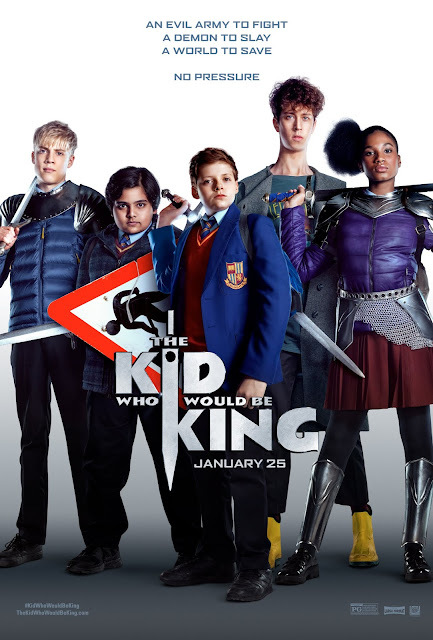 The film is written and directed by Joe Cornish and stars Louis Ashbourne Serkis, Dean Chaumoo, Tom Taylor, Rhianna Dorris, Angus Imrie, with Rebecca Ferguson and Patrick Stewart. And she was right. How often is it that a girl can see live theatre about girls in which there is no male love interest, father, brother or male friend vying for the spotlight. 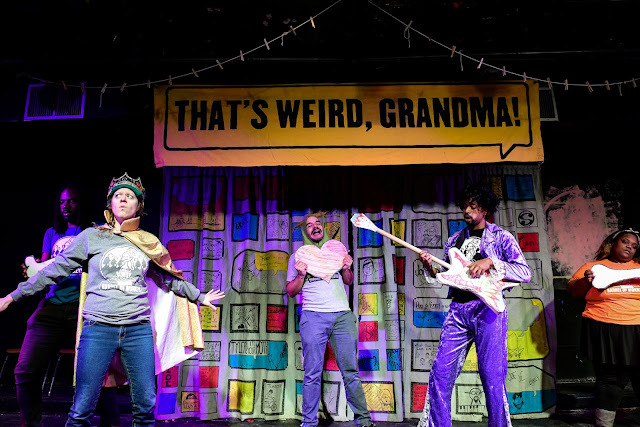 This show, directed by Gina Rattan with book and lyrics by Sandy Rustin, is one of those rare gems. On that front, there was a lot to be happy about with this show in which five girl campers and their young counselor explore their strengths and talents in an environment of camaraderie. I liked that the cast, like the American Girl dolls themselves, reflected the diversity of America—as did the audience of little girls, many of whom were hugging American Girl dolls that looked like them. And it didn’t end at racial diversity. The show celebrated the athleticism, intellect, caring and artistry of girls. Prizes were given out for extraordinary displays of girl power—and it was nice that those were often subtle victories, like expressing your needs, even amongst a group of new people or trying hard to build a robot, even if it still didn’t work out. I had the chance to see the show with my 8-year-old daughter and her two friends. While none of them are big American Girl enthusiasts, they still enjoyed the show. They did wish that it was more about the dolls. While each camper has a doll and their doll is instrumental in helping them overcome their particular challenge by briefly touching on their own story, most of the stage time centers around the campers themselves. 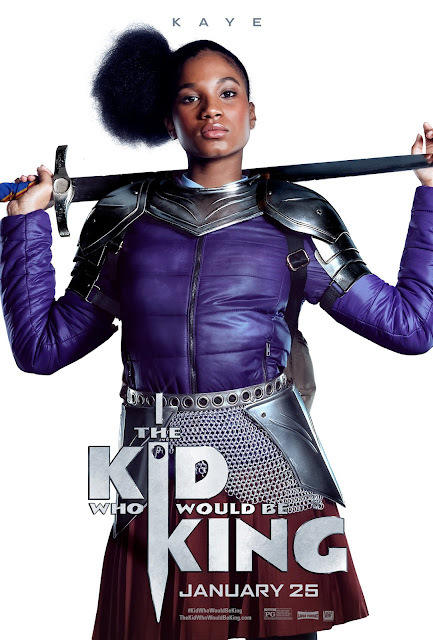 The cast did a great job, especially Monica Poston as the counselor, Jenna Bruce as the new girl and singing powerhouse Laila E. Drew as a wannabe pop star. Poston and Bruce performed an especially fun number full of ‘30s dance moves. 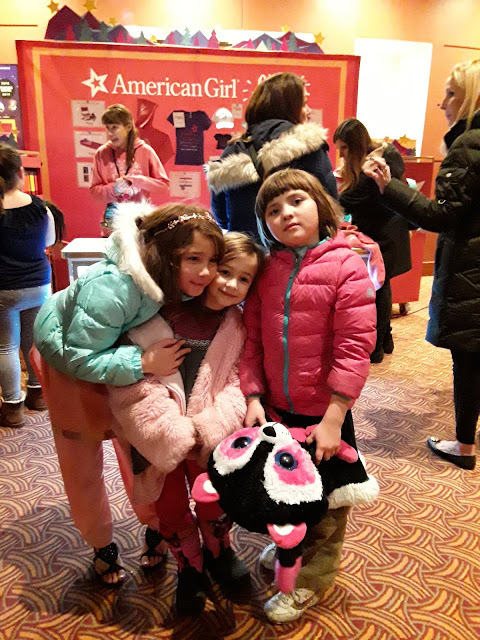 If your girl adores American Girl or just being a girl, you’ll do well to take her to American Girl Live. American Girl Live, an all-new musical inspired by the popular characters from American Girl® owned by Mattel, Inc., will celebrate its world premiere at the North Shore Center for the Performing Arts in Skokie Dec. 21-23, 2018. Tickets and VIP packages are available now and may be purchased at the North Shore Center box office, NorthShoreCenter.org or by calling 847-673-6300. 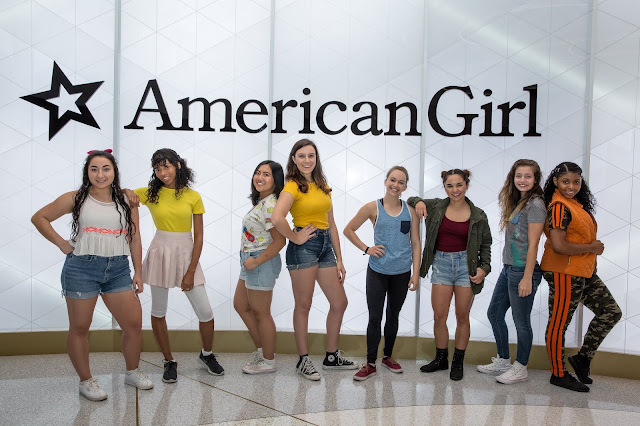 American Girl Live will feature all-original songs and an unforgettable experience for fans of American Girl as they witness some of their favorite characters come to life, including Rebecca, Nanea, Maryellen, Melody, Julie and this year’s, Girl of the Year, Luciana Vega. Audiences will join a group of girls at sleepover camp for an exciting summer away from home. When each camper is faced with a new challenge or experience, she comes to better understand the timeless lessons of her favorite American Girl character through heartfelt story and song. The messages shared provide positive examples of friendship, courage, and hope that will extend beyond the performance and into the hearts of the audience. 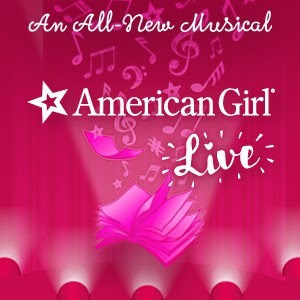 American Girl Live is a creative collaboration between American Girl and Mills Entertainment. 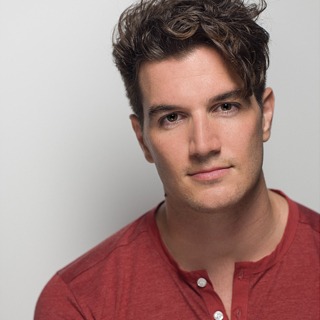 The musical features a script and lyrics by Glenview native Sandy Rustin, is produced by Steppenwolf Theatre veteran Simone Gianfrancesco, music by Meg Zervoulis, choreographed by Emilie Renier and is directed by Gina Rattan. 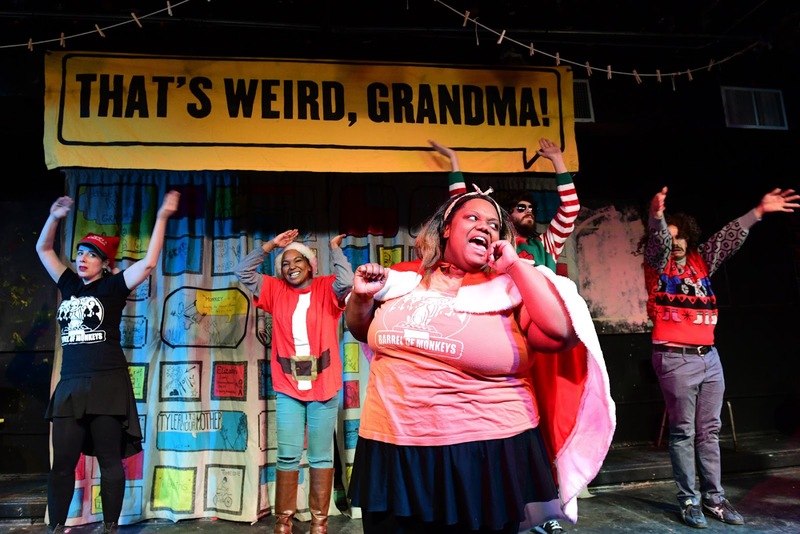 The all-female creative team vows to “celebrate girls” and promote positivity and perseverance which audiences can expect to see when the production hits the stage for the first time this holiday season. Gina Rattan (Director) is a musical theater director and has worked as the Associate Director for a variety of Broadway productions including, “Angels in America,” “Matilda The Musical,” “Soul Doctor,” “Rodgers + Hammerstein’s Cinderella” and “Billy Elliot.” She was also involved in the live TV musicals “Peter Pan” and “The Sound of Music” on NBC. 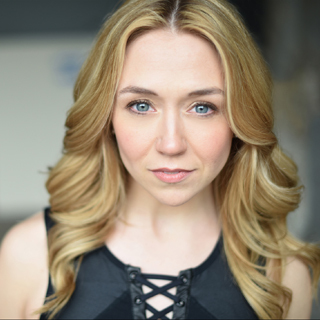 Her regional credits include productions at ART, Old Globe, Guthrie Theater, Lone Tree Arts Center, Theater Raleigh and Theater Workshop of Nantucket. 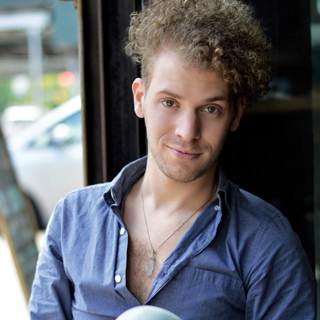 Rattan is currently the director of the “Rodgers + Hammerstein’s Cinderella” national tour and is working on several new productions. She is a member of The Wing and champion of the work, thoughts and rights of women and girls. Emilie Renier (Choreographer) is a New York City based choreographer who has choreographed and performed in productions both nationally and internationally. Some of her performing credits include, “Rodger’s + Hammerstein’s Cinderella” (national tour), Disney’s “Beauty and the Beast” (national and international tour), “Mary Poppins,” “The Sound of Music,” “Singin’ in the Rain,” “Peter Pan,” “She Loves Me,” “A Man of No Importance,” “RENT,” “Kiss Me, Kate,” “Nine” and others. Reiner has served as the Assistant Choreographer for the national tour of “Rodger’s + Hammerstein’s Cinderella,” “Hair,” “Kiss Me, Kate,” “Little Women” and many more. 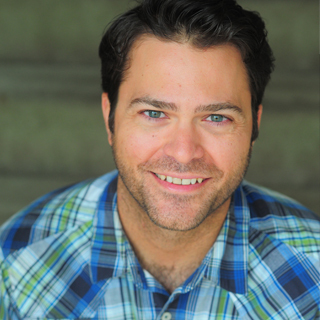 Simone Gianfrancesco (Executive Producer) is a senior producer and development executive with Mills Entertainment (a CAA company). Her varied portfolio includes such clients and partners as A&E Television Networks (Bring It! Live), John Cleese and Eric Idle, Iyanla Vanzant, Lilly Singh, Tyler Oakley, the Fred Rogers Company (Daniel Tiger’s Neighborhood Live), and the Jim Henson Company (Dinosaur Train Live, Sid the Science Kid Live). 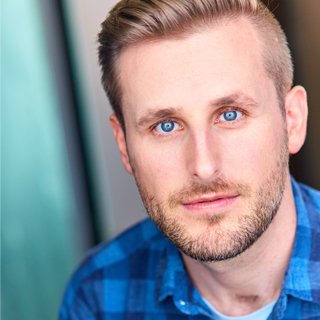 Select regional credits include productions with Steppenwolf Theatre Company, La Jolla Playhouse and About Face Theatre. Upcoming projects include collaborations with the Joan Rivers estate and with Turner Classic Movies. Simone focuses her work on bringing diverse and aspirational content to all communities, specifically to young women; she is proud that this partnership with American Girl® furthers that objective, building girls of strong character. 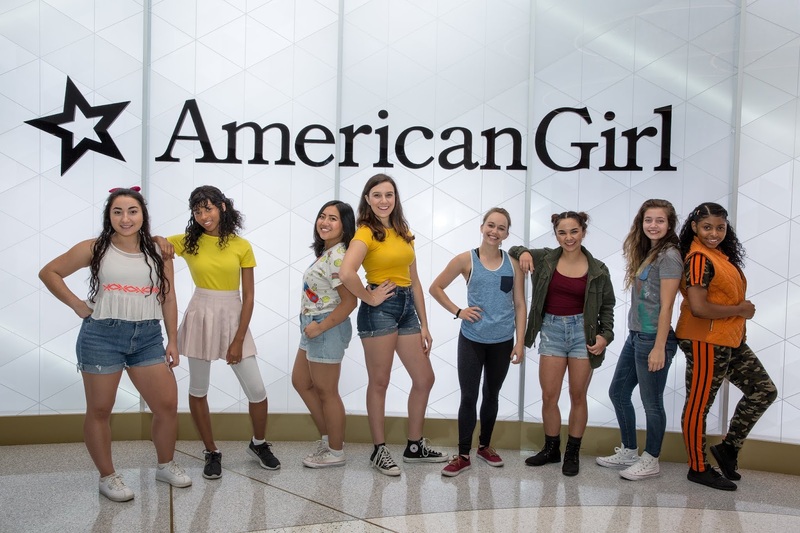 American Girl Live will perform at The North Shore Center for the Performing Arts in Skokie on Friday, Dec. 21 at 7 p.m., Saturday, Dec. 22 at 1 p.m. and 5 p.m. and Sunday, Dec. 23 at 1 p.m. Tickets range in price from $37 - $47 and are available now. Special VIP packages featuring a pre-show party and post-show photo opportunity with the cast are also available. Please visit, NorthShoreCenter.org or call 847-673-6300 for more information. 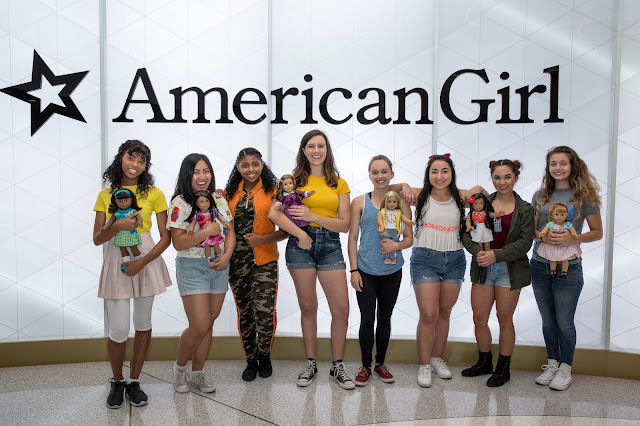 American Girl is a premium brand for girls and a wholly-owned subsidiary of Mattel (NASDAQ: MAT), a leading global children's entertainment company that specializes in design and production of quality toys and consumer products. Headquartered in Middleton, WI, American Girl offers an inspiring world of dolls, content, and experiences that nourish a girl’s spirit and help develop her strength of character. Best-selling lines include Truly Me™, Girl of the Year™, Bitty Baby™, WellieWishers™, and American Girl’s classic historical characters. The company sells products through its award-winning catalogue, on americangirl.com, in its proprietary U.S. experiential retail stores, as well as at specialty retailers nationwide. By inspiring girls to be their best, American Girl has earned the loyalty of millions and the praise and trust of parents and educators. As the leading producer and promoter of branded live entertainment in the United States, Mills Entertainment, a division of Creative Artists Agency (CAA), collaborates with top talent and property holders to create unforgettable live experiences. With full global distribution and partnerships worldwide, their specialty is taking shows from concept to stage, serving as the complete solution in realizing the vision. Current projects include Ripley’s Believe It or Not! Carnival of Curi-oddities, Daniel Tiger’s Neighborhood Live!, Theresa Caputo Live! The Experience, Bring It! Live and Miraculous. . For more information visit, www.millsentertainment.com. The North Shore Center for the Performing Arts in Skokie is a dynamic two-theater complex designed by Boston architect Graham Gund and opened in November 1996. The North Shore Center is managed by Professional Facilities Management, Inc. and operates as part of the Village of Skokie’s plan to provide cultural, literary and educational programs to benefit the citizens of Skokie and Chicago’s North Shore. The facility features an 867-seat main theater, and a convertible 318-seat theater, which serves as the home to Northlight Theatre. In addition, there is a 6,000 square foot grand lobby, rehearsal hall and conference rooms. 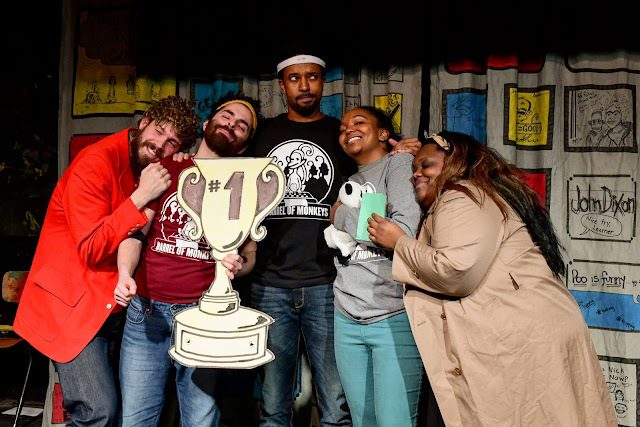 The North Shore Center presents a Feature Series and the curriculum-based Youtheatre program, which has provided supplemental arts education to over a million Chicago area students since its launch in 1980. Located 30 minutes from Chicago’s Loop and conveniently across from Westfield Old Orchard Mall, the Center is in close proximity to many excellent dining, shopping and hotel options. Free parking is also abundantly available. For more information or tickets to its diverse programming, please visit NorthShoreCenter.org. 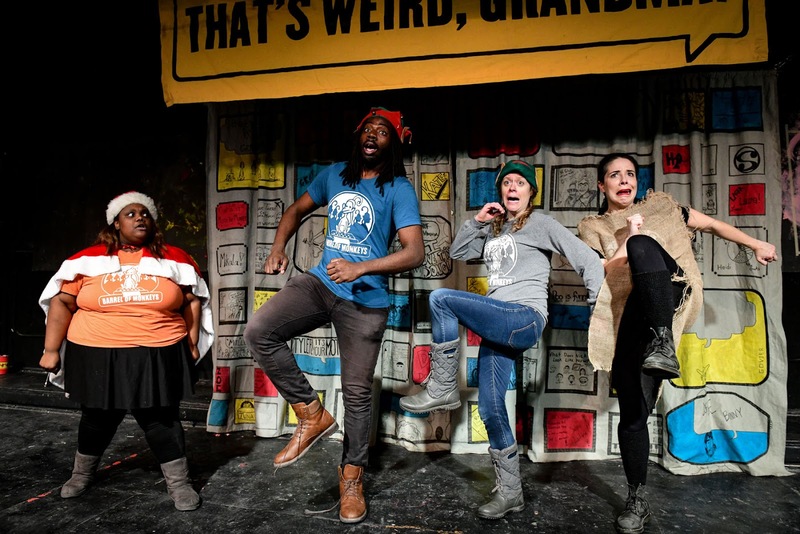 (left to right) Barrel of Monkeys company members Oly Oxinfry, Noah Appelbaum, Barry Irving, Ashley Bland and Kayla Pulley, perform “The Girl and the Panda” Photo by Evan Hanover. All my teacher friends can attest to the fact that kids come up with some crazy stories. Barrel of Monkeys (BOM) takes this rampant kid creativity one step further by mounting these stories on stage and even adding music to some of the sketches. The result is a bit absurd, a bit surreal, and a big dose of funny. 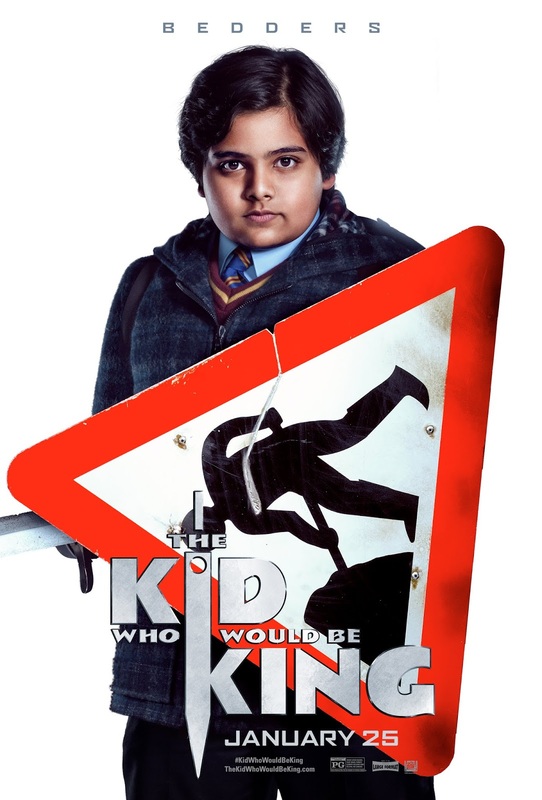 We can vouch for the "written by kids" claims, as every scene begins with the school and names of all the writers. We can also enthusiastically verify the "enjoyed by humans" part. My 17 year old son and I laughed throughout the production last night. In fact, we've been enjoying BOM shows for years. (**I do have to say, we've never laughed as hard as we did at the "Elephants Come To My House" sketch, years ago. That's still our reigning BOM fav.) That said, the current show's pretty freakin' funny! The jury's still out on the "performed by adults" part. I'd swear these professional actors are truly oversized children in disguise. 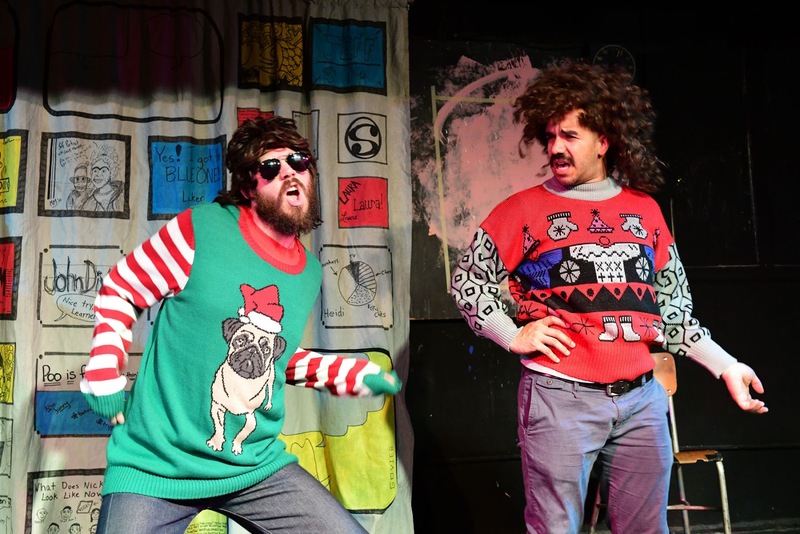 They're the perfect blend of over the top energy, comedic timing, and wacky facial expressions to bring these pieces to life. Adults or not, they slay with this seasonal treat. 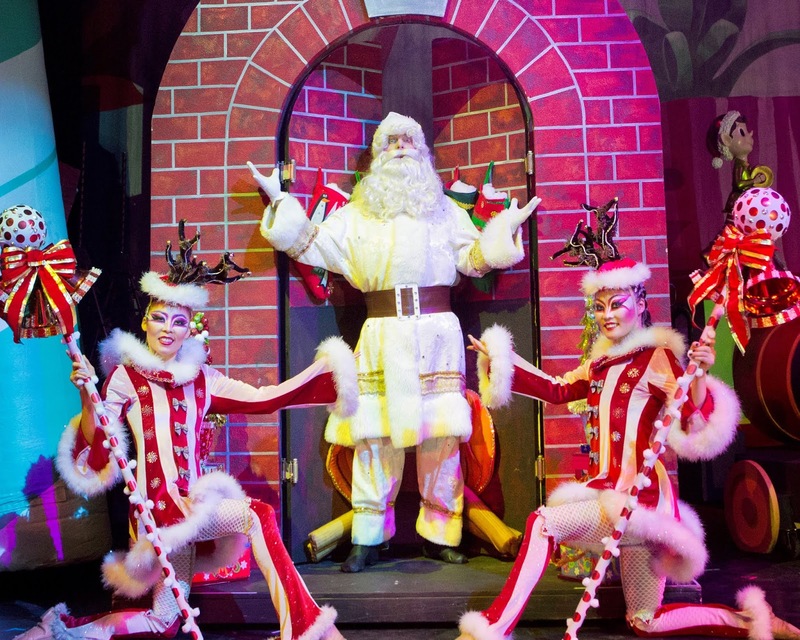 (left to right) Barrel of Monkeys’ company members Kayla Pulley, Stewart Romeo, Meredith Milliron and Raquel Torre perform “Santa’s Mean Day” Photo by Evan Hanover. What's more fun than a Barrel of Monkeys? How about a holiday themed compilation featuring Barrel of Monkeys faves from seasons past, mixed with nog snorting new nuggets of hilarity that are sure to make your holiday merry and bright. All the usual holiday suspects are here, like Santa, reindeer, elves, a poignant tribute to Hanukkah in song, and even Krampus. Yet BOM doesn't stop there. Expect a mash up of the macabre, including multiple monsters, apex predators, and dead rock stars in cozy concert venues. 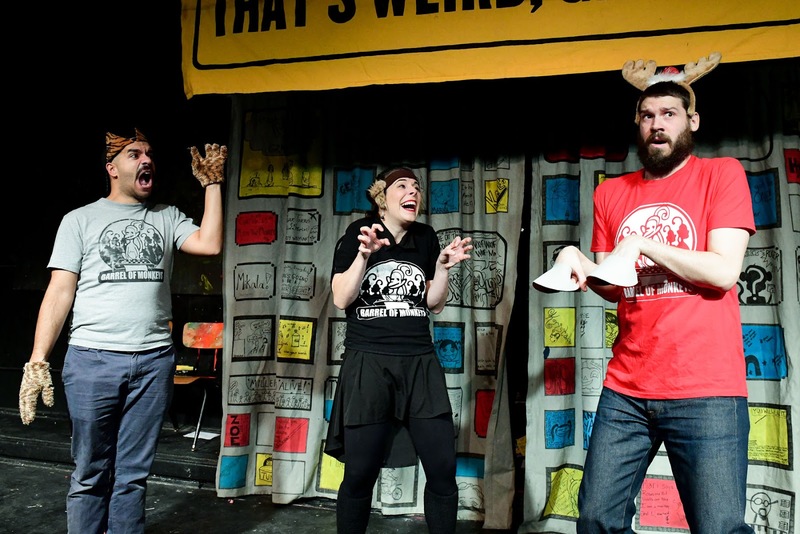 (left to right) Barrel of Monkeys company members Stewart Romeo, Meredith Milliron, Brandon Cloyd, Barry Irving and Kayla Pulley perform “Monster’s Belly” Photo by Evan Hanover. 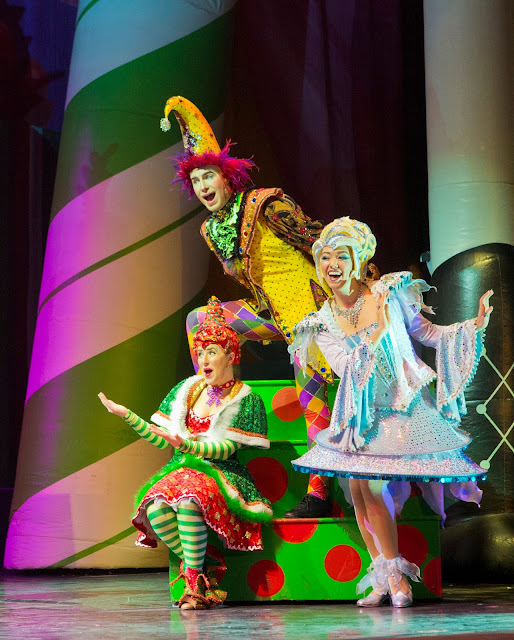 (left to right) Barrel of Monkeys company members Brandon Cloyd, Raquel Torre and Oly Oxinfry perform “The North Pole” Photo by Evan Hanover. In one of our favorite pieces, BOM makes a dramatic entrance "purse first", as a rather outspoken handbag named Betsey Johnson who scares her "purse landlord" into fulfilling all her demands. Purse first indeed! (left to right) Barrel of Monkeys company members Ashley Bland, Raquel Torre, Brandon Cloyd and Oly Oxinfry perform “Dear Purse Landlord” Photo by Evan Hanover. 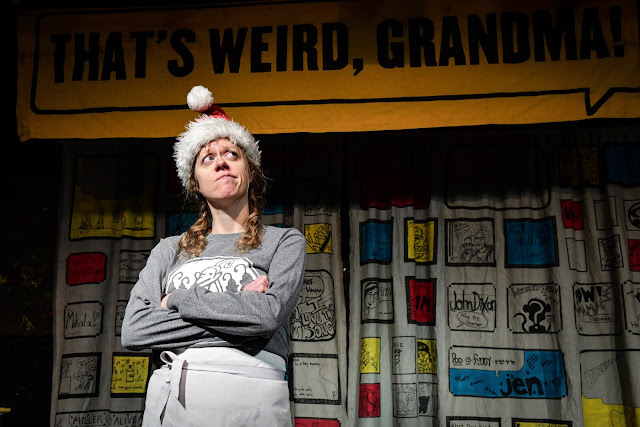 We're still snickering over the directionally challenged child who tried to ride a reindeer southwest to the North Pole, a hip hop ode to the joys of messier houses that I'm completely on board with, and too many more to mention. Generally you have to wait for Mondays to roll around to catch these monkeys, but the holiday special is also happening this Thursday through Saturday, so you have zero excuses. It's a great, all ages show, as funny to young kids and teens as it is for so called "grownups". Don't miss this! (left to right) Barrel of Monkeys’ company members Oly Oxinfry and Brandon Cloyd perform “Messier Houses” Photo by Evan Hanover. 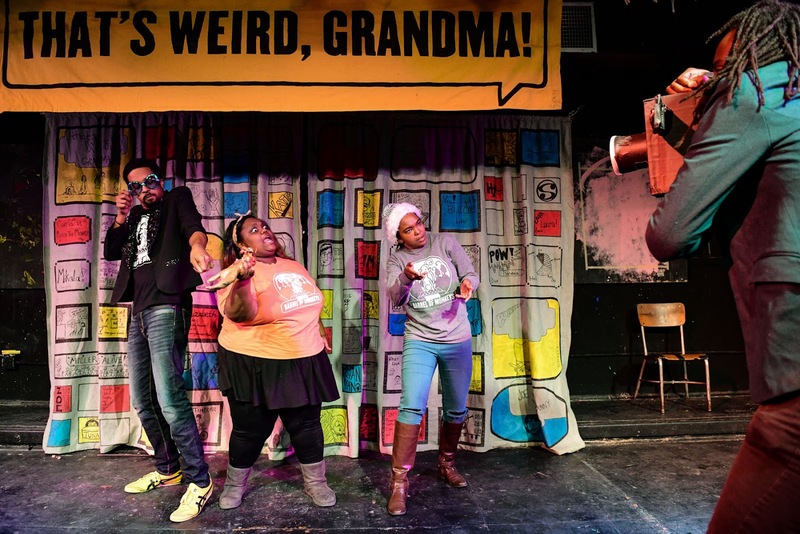 Barrel of Monkeys’ company members (front) Kayla Pulley with (back, l to r) Raquel Torre, Ashley Bland, Oly Oxinfry and Brandon Cloyd perform “Messier Houses” Photo by Evan Hanover. 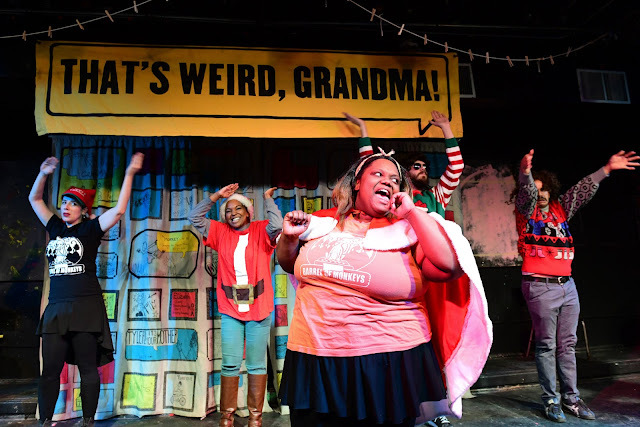 playing Mondays at 8 pm (plus special weekend performances) through December 22, 2018 at the Neo-Futurist Theater, 5153 N. Ashland Ave. in Chicago. Tickets are currently available at www.barrelofmonkeys.org or by calling (773) 506-7140. 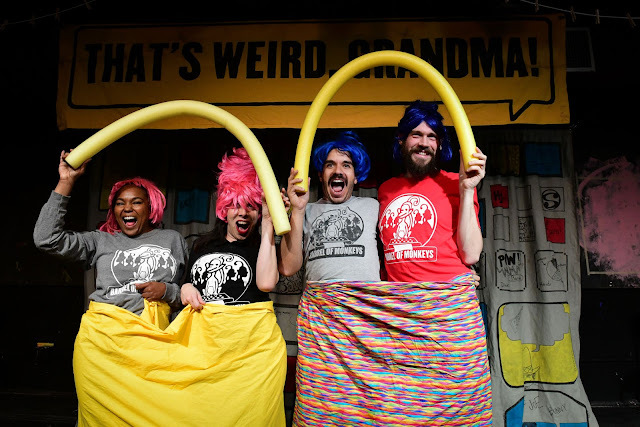 Barrel of Monkeys’ beloved holiday special returns with a mix of classic stories from the That’s Weird, Grandma repertoire alongside brand new sketches and songs. Make That’s Weird, Grandma your family’s newest holiday tradition! 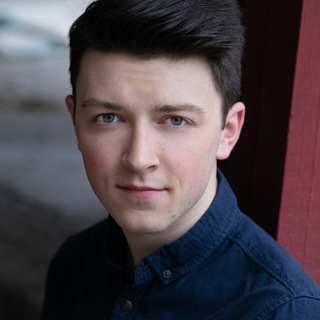 The cast includes Noah Appelbaum, Maeli Goren, Jordan Harris, Barry Irving, Meredith Milliron, Oly Oxinfry, Kayla Pulley, Mary Tilden and Raquel Torre. (left to right) Barrel of Monkeys’ company members Barry Irving, Kayla Pulley, Ashley Bland and Stewart Romeo perform “The Butler” Photo by Evan Hanover. Tickets: Preview: $10 for adults, $5 children 12 and under, $8 groups of 10 or more. Regular run: $20 for adults in advance; $5 for children 12 and under; $12 for seniors, students, veterans/military and groups of 10 or more. Teen Arts Pass (TAP) members: $5 with ID. Tickets are currently available at www.barrelofmonkeys.org or by calling (773) 506-7140. (pictured) Barrel of Monkeys company member Meredith Milliron performs “Jerry Like to Work” Photo by Evan Hanover. 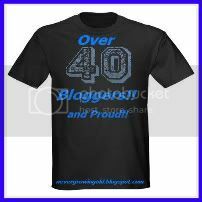 All our reader also qualify for a 25% discount on all tickets throughout the Chicago run! Promo code HERON provides an exclusive 25% off discount. My family adores magic. My teens have mastered a few card tricks and illusions themselves and we enjoy catching the pros in action. I'll be out with the family Sunday the 23rd for the press opening, so check back soon for my full review. In the meantime, ChiIL Mama's pleased to partner up with iMAGICIAN and the Harris Theater on a stellar ticket giveaway for our readers. I have a great 25% off code for my readers good for all tickets throughout the Chicago run at Harris Theater. And one lucky reader will WIN a pair of tickets! Enter below. Tickets make great clutter busting, experiential gift ideas for the holidays. Make memories, not messes! Don't miss one of this season’s hottest production coming to Chicago. 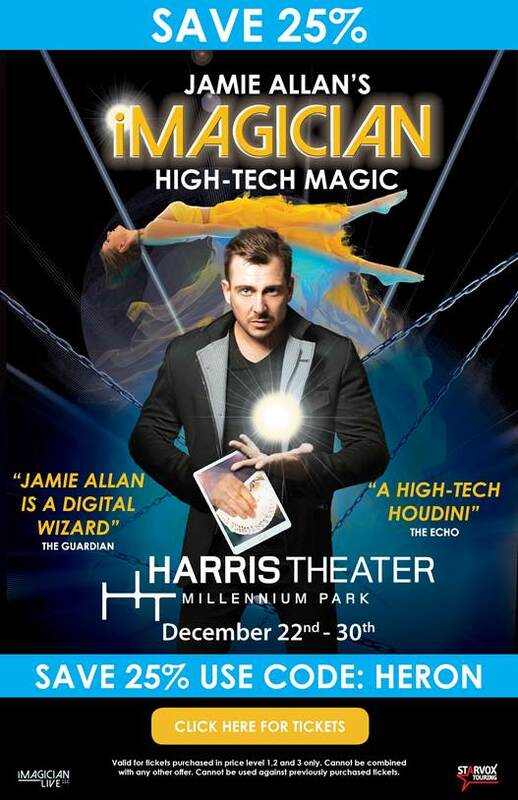 The producers of Jamie Allan’s iMagician, a show combining trickery and illusion with technology, are delighted to announce the U.S. premiere in Chicago at the Harris Theater (205 E. Randolph) for a limited two-week engagement beginning Dec. 22, 2018 through Jan. 6, 2019. Perfect for a unique twist on your holiday shopping this year! ·The Laser Levitation: A jaw-dropping illusion in which performers fly over the stage, supported only by laser beams. ·Houdini 2.0: Tackles the legendary Harry Houdini’s most dangerous illusions while incorporating modern technology, such as combining immersive video mapping technology with a thrilling underwater escape. Disclosure: We have been given complimentary tickets for review purposes and for our giveaway. As always, all opinions are my own. Broadway In Chicago is delighted to announce there will be a digital lottery and rush tickets for the Tony Award ®- nominated Broadway revival of FIDDLER ON THE ROOF. FIDDLER ON THE ROOF will play the Cadillac Palace Theatre (151 W. Randolph) for a limited three-week engagement December 18, 2018 – January 6, 2019. A digital lottery will begin Dec. 17 at 9AM, and twenty-six tickets will be sold for every performance at $25 each. The lottery will happen online only the day before each performance. Seat locations vary per performance. ·After payment has been received, patrons can pick up tickets at the Cadillac Palace Theatre (151 W. Randolph) no sooner than 30 minutes before show time with a valid photo ID. In addition, a limited number of day-of show rush tickets are offered for $39 per ticket. These will be available at all performances of the run for purchase in-person at the Cadillac Palace Theatre box office beginning when the box office opens daily. Seat locations vary per performance. Individual tickets are on sale and range in price from $25-$98 with a select number of premium tickets available. Tickets are available for groups of 10 or more by calling Broadway In Chicago Group Sales at (312) 977-1710 or emailing GroupSales@BroadwayInChicago.com. For more information, visit www.BroadwayInChicago.com. Broadway In Chicago was created in July 2000 and over the past 18 years has grown to be one of the largest commercial touring homes in the country. A Nederlander Presentation, Broadway In Chicago lights up the Chicago Theater District entertaining more than 1.7 million people annually in five theatres. Broadway In Chicago presents a full range of entertainment, including musicals and plays, on the stages of five of the finest theatres in Chicago’s Loop including CIBC Theatre, Oriental Theatre (soon to be Nederlander Theatre), Cadillac Palace Theatre, and just off the Magnificent Mile, the Broadway Playhouse at Water Tower Place and presenting Broadway shows at The Auditorium Theatre of Roosevelt University. Cirque Dreams Holidaze at the Chicago Theatre was a truly enjoyable spectacle. I had the pleasure of seeing it with my 10- and 4-year-old boys, Adam and Ali. This show is for you if you enjoy exquisite showmanship, good music, and incredible costumes. The brainchild of Cirque Dreams founder Neil Goldberg, it features talented cirque artists, singers and dancers from all over the world. Adam and I were totally wowed by the opening diablo act, as well as what seemed to be a father/son gingerbread man acrobatics routine—both of which appeared to defy the laws of physics. I really loved the first male/female acrobat duo. Their routine was sensual and surprising and showed off the man's talent as well as the woman's, a rare dynamic in an art where the larger person tends to act as a support while the smaller one gets to do all the jaw-dropping stuff. Adam, my tween, really liked the fast-moving bouncy-ball juggling act routine and the death- defying penguin balancing routine. Both boys adored the man who wielded what looked like a 10-foot-circumference hula hoop. Who am I kidding? I loved it too. I mean, it's a freaking 10-foot hula hoop, people! Just imagine getting it going and the footwork needed to keep his hips ahead of the game while it loomed out over the orchestra pit! Ali, the youngest the youngest member of our party was particularly enchanted by the huge snow-people. They were not a main act, but one of the many charming-to-eerie background acts that had us often making tough decisions about where to focus our attention. Yes, I said eerie up there. This show balances festive, humorous, poignant, and what I'll call a Something Wicked This Way Comes feel. In this vein, the scene with the acrobatic dancing couple echoed by a dancing ghost couple behind them was achingly beautiful. 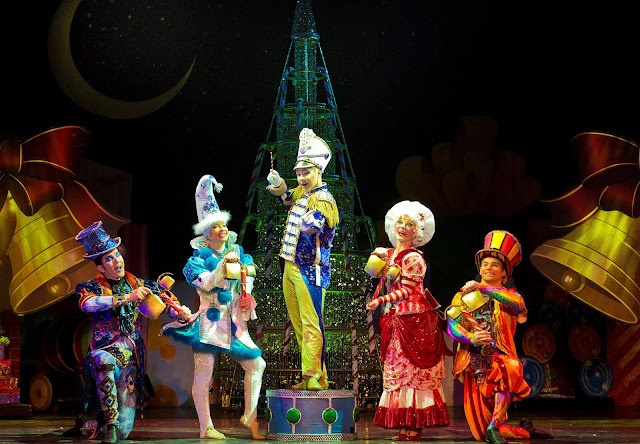 The show is set up as an opportunity to see the secret lives of Christmas ornaments, but there was no discernible storyline running through the vignettes. The only drawback of that is that there was so very much to see that it was hard to process. A more powerful through-line of story would have helped there. I should point out that there was juggling, aerial arts (including a brilliant two-man hoop routine), a high wire act, and other components one would expect to see. They were all so fabulous. I wish there was space and time to describe them and especially to give credit to each of the artists. This is a great way to test their readiness for a a big theatre. It's a really loud show, so their inevitable chatter is okay. Cirque Dreams Holidaze is very stimulating. My four-year-old loved it but was truly done by intermission. Be prepared to leave early. I promise that even half the show is worth the cost of admission. 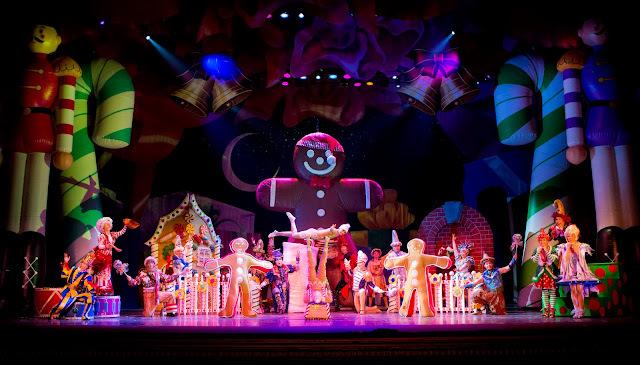 All told, I'm excited to recommend this show as a it was truly unique holiday outing for families. 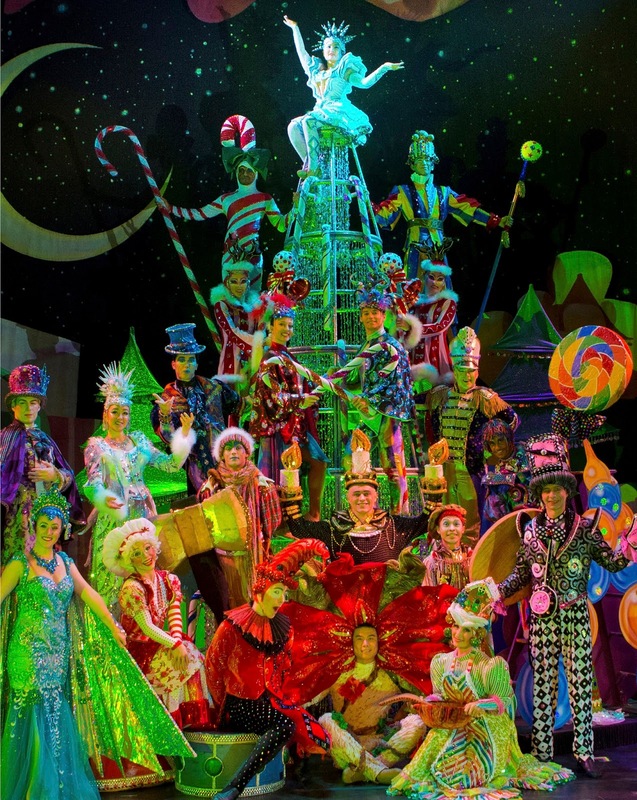 CIRQUE DREAMS HOLIDAZE brings its popular and electrifying stage spectacular to The Chicago Theatre, 175 N. State Street, with eight unforgettable performances presented by Jam Theatricals. 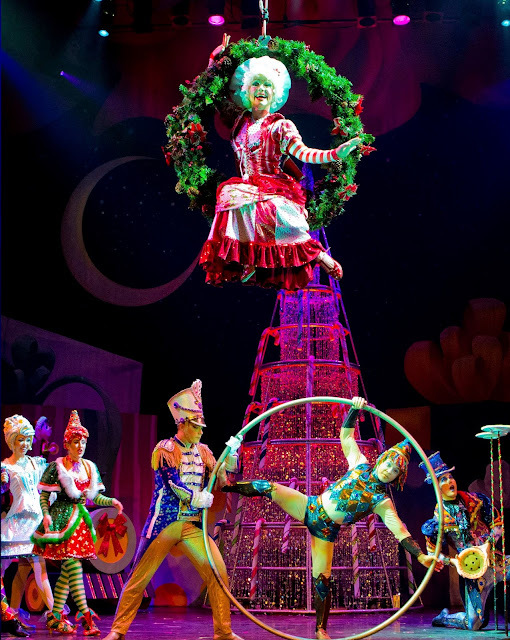 This critically-acclaimed extravaganza is a combination of a Broadway musical and a Cirque adventure wrapped into a spectacular holiday gift for the entire family. Tickets are on sale now. 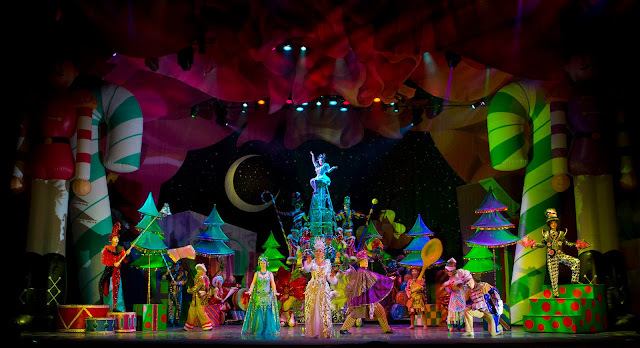 Broadway Director and Cirque Dreams Founder Neil Goldberg has searched the world to assemble the most unique cast of incomparable cirque artists, singers, dancers and theatrical talent to wow audiences nationwide in 2018. 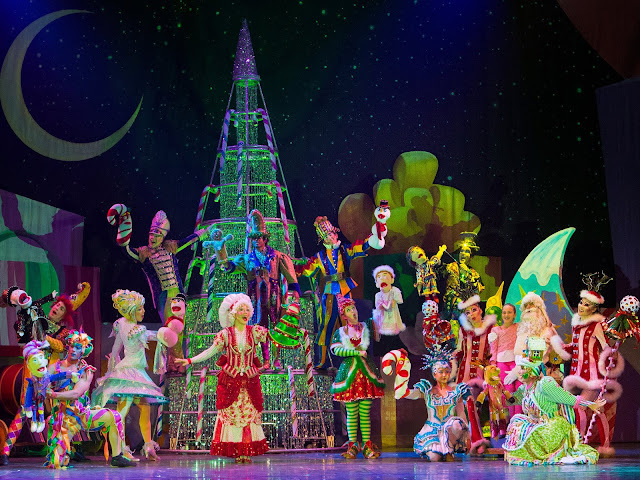 Set in a multi-million-dollar wonderland of season’s dreams and holiday pageantry, audiences around the country will celebrate the most wonderful time of the year with eye-popping performances, more than 300 spectacular costumes, 20 of the world’s jaw dropping acts, the talented singers, original music and seasonal favorites. 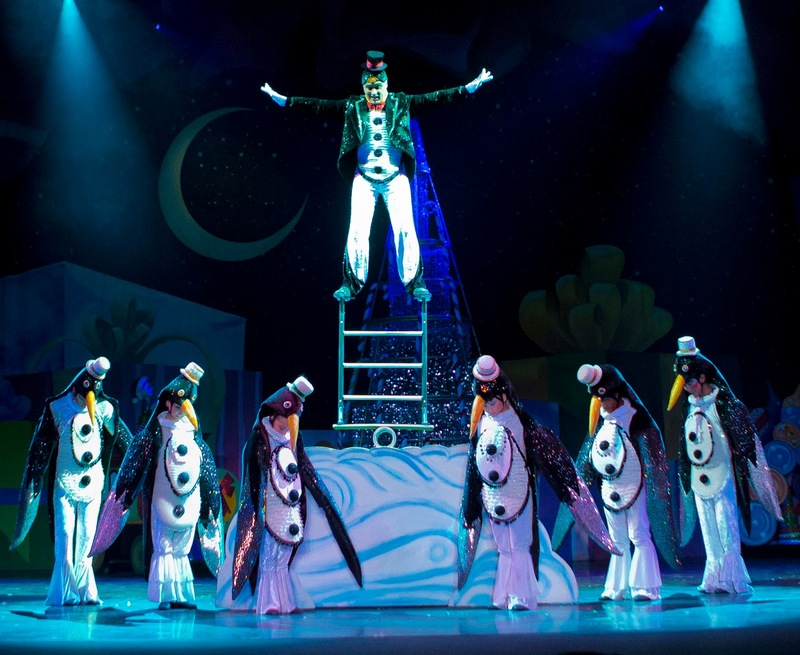 Audiences will experience elaborate costumed characters, including snowmen, penguins, candles, reindeer, toy soldiers, gingerbread men, Santa and ornament as they fly, balance and stretch imaginations in this festive holiday celebration. Exciting theatrical production numbers, illusions and gravity-defying feats will leave viewers on the edge of their seats. 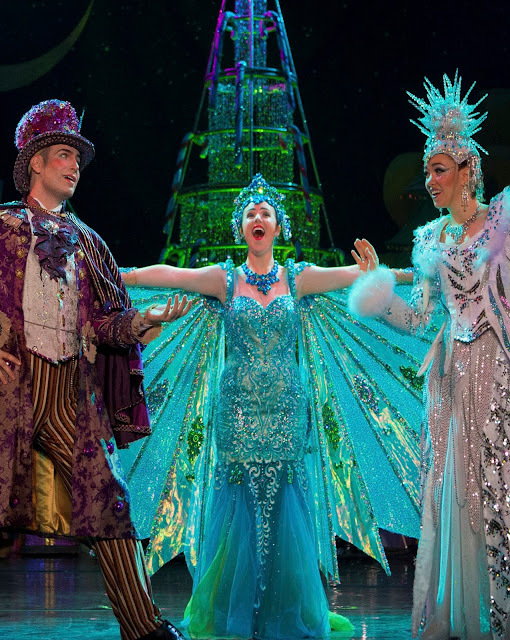 It’s “Las Vegas…meets family entertainment…meets musical theatre” raves the Boston Globe. Cirque Dreams Holidaze is priced from $25 to $125 and will feature eight performances at the Chicago Theatre, 175 North State Street, from December 12 through December 16. 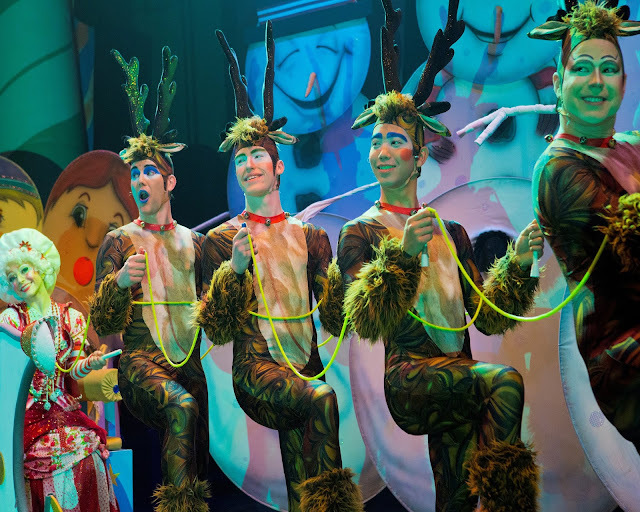 The performance schedule is December 12, 13, 14 at 7:30 p.m.; December 15 at 11 a.m., 3 p.m. and 7:30 p.m. and December 16 at 1 and 5 p.m. Tickets are available at The Chicago Theatre box office, all Ticketmaster locations, ticketmaster.com or via phone at 1-800-745-3000. Group discounts for 10 or more are available by calling Grouptix at 773-327-3778. 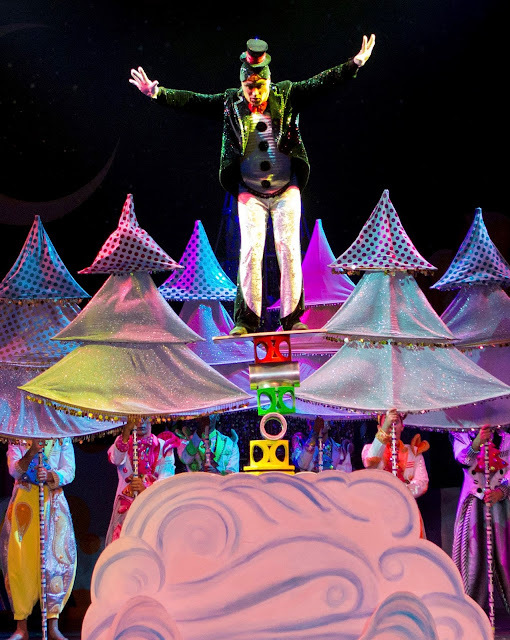 The Cirque Dreams franchise is a globally recognized entertainment brand that has produced shows for Broadway, theatre tours, casinos, theme parks, resorts, governments, cruise lines and venues worldwide. Since 1993, more than 50 million people have experienced a Cirque Dreams show. Productions have garnered critical acclaim from USA Today, Associated Press and the New York Times to CNN, Today Show and Fox & Friends. Neil Goldberg has been declared "one of today’s leading theatrical impresarios" by the LA Times and “uniquely ingenious” by the New York Daily News. Other brand titles include the Broadway Hit Cirque Dreams Jungle Fantasy, Cirque Dreams Rocks and Cirque Dreams Revealed. Cirque Dreams Holidaze continues touring the Unites States with multiple productions. 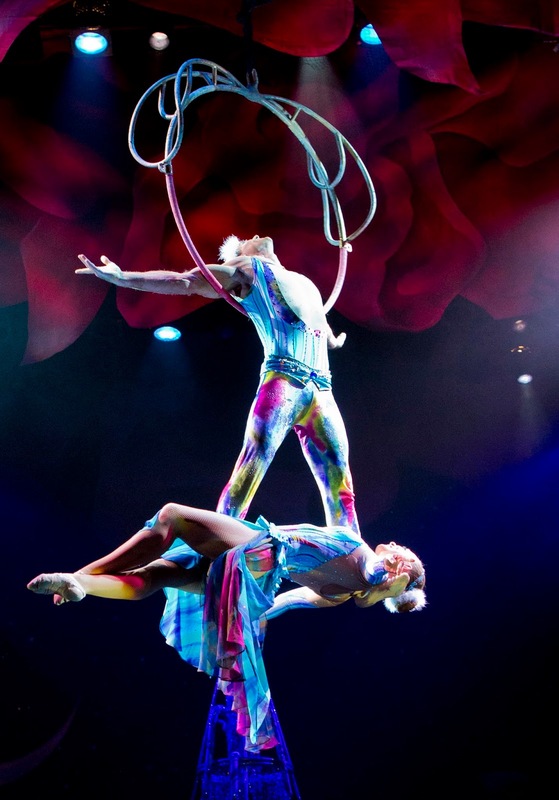 Cirque Dreams Unwrapped performs annually at Gaylord Palms Resort in Orlando. 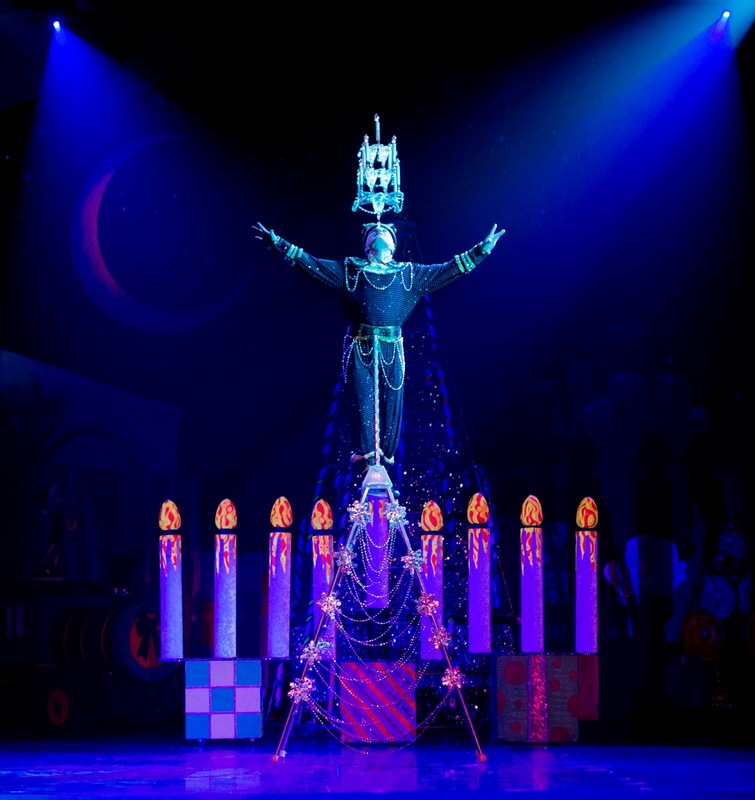 Three distinctive Cirque Dreams shows perform year-round onboard Norwegian Epic, Breakaway and Getaway. Neil Goldberg works with major celebrities, artists, holds various industry, leadership and Board of Director positions and is founding philanthropist of the Neil Goldberg Dream Foundation established to enrich the arts. For more information, visit www.cirqueproductions.com. Cirque Dreams Holdings LLC is a division of the VStar Entertainment Group of quality family shows and experiences worldwide.